In its bid to upskill Basic Sea safety fishing and deck hand fishing with knowledge of nau­tical techniques, the Fiji Maritime Academy (FMA) for the first time is offering a Fishing programme as per the Standards of Training, Certification and Watchkeeping of 1995. The programme will consist of Basic Sea Safety Fishing and Deck­hand Fishing which comprises of Nautical Knowledge, Basic Sea­manship, Fishing Techniques, By-catch, Fish Handling and Fish Processing, Near Coastal Fishing Mate and Skipper and Offshore Fishing Skipper. FMA Principal Lecturer Nautical Science, Captain Tevita Robanaka­davu said the programme aims to provide qualification and upskill the work of fish handling and pro­cessing in Fiji and the Pacific. “Over the years people do not get the education nor the qualification to operate in this field,” Captain Robanakadavu said. “It has been the case for people are employed by shipping moguls and they learn while on the job,” he said. Captain Robanakadavu said the programme was divided into two structures with scholarships of­fered by the New Zealand govern­ment. “The other structure is Near Coastal Fishing Skipper Upgrad­ing and the pre-requisite is age 18 years and above and has to serve 24 months of approved sea time prior attending a semester at the Acad­emy. “The scholarship has been made possible through funding from the New Zealand Aid programme and coordinated by WWF-Pacific." “Twenty-Five scholarships for the Deck hand Fishing Programme and the pre-requisite, age between 18 years to 25 years with Form 4 or Year 10 pass and fifteen schol­arships for the Offshore Fishing Skipper programme, pre-requisite age between 18 years to 25 years, Form 6 or Year 12 pass with Eng­lish, Maths and Physics. “In accordance with the IMO Women in Maritime Initiative, and the NZ Aid equal opportunity pol­icy, females are strongly encour­aged to apply. 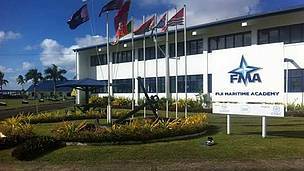 “All applications should be ad­dressed to the Academic Officer, Fiji Maritime Academy, PO Box 10963, Laucala Beach Estate, Nas­inu as applications close on Friday 1th January, 2019.